OMG - the 9th photo cracked me UP! Pull it together, Lamms! Eyes front! Never mind. Eyes shut! Oh gosh, they are so sweet! I think we need some name tags to distinguish the twins Edna and Edison/Eddie. I think I can tell them apart when they are side by side (Edna's markers are slightly darker? ), but when it's just one on its own...I'm baffled! Zelda is going to be one gorgeous lady. And Baxter? Who can resist an orange tabby boy? I've tried to order this Basket of Lamms several times now from the IBKC shop site, but no matter what I do it doesn't show up in the online cart! 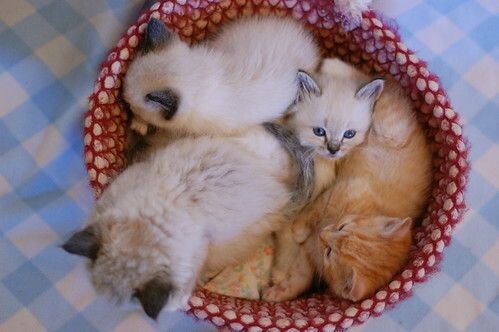 Ah, the famous kitten basket, now filled with tiny Lamms . . .
Do you have orange girls? I've heard of them, but have never actually met one. I adopted my wonderful pale orange boy thinking he was a girl, but no. He's gorgeous and wonderful anyway, but the vet told me that almost all marmies are boys! I have heard that most orange cats are boys (like my Simba). But if you look to the index on the right and find Rhoda Darling, click and meet a beautiful orange girl. Yes, I have a full orange girl with one white paw, a full orange girl with 4 white paws (only the pads), a half orange/half white girl, and a white girl with orange spots..all sisters. They have a full orange brother, no white at all but he lives with friends. 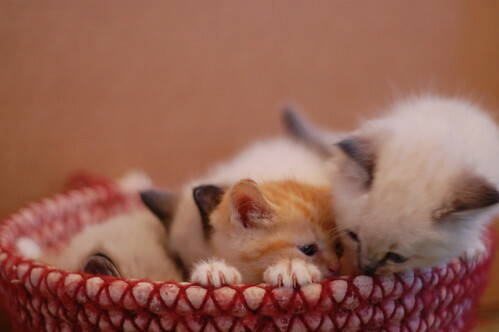 Oh my goodness - that is one tiny basket with a lot of cuteness. Love the last pic where they just close their eyes and surrender to the paparazzi taking their pictures. How much longer till the intro to their instructor Ms Bean? A week? I think I might just be able to squeeze in there with them. Or not. But I'd try. I never realize how tiny the new recruits are until I see them in the basket! I think that 9th picture resembles a baby Bean... You know things are moving along when the pink basket shows up... love it!! 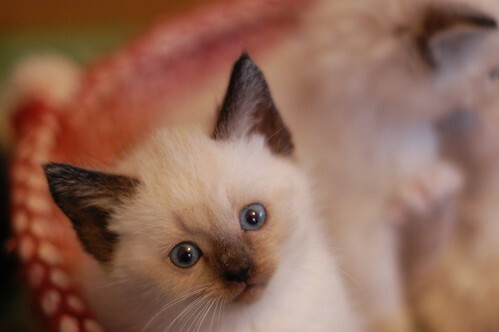 And thanks for the kitten fix!! Love the crossed paws. I don't work too hard learning their names ... I just want to waller in their gorgeousness. Oh this Is just criminal. Nothing should be allowed to this cute. Omg Laurie how can u stand it? Bean will be so happy - all those little bodies to bathe lol. tears in my eyes from the mega cuteness of this post! I'm in love with each one of them. Oh dear-this is just too much. 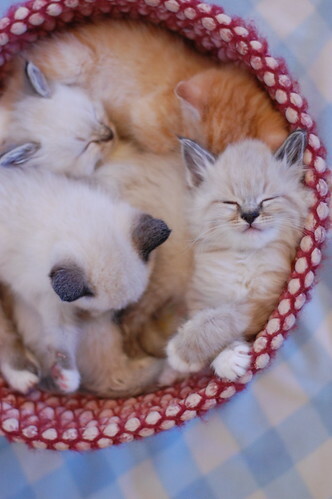 So much floof and cute in one basket! But to be perfectly honest...I think I am most in love with Zelda. The cute-o-meter has just crashed from input overload! I'm slain. I'm almost sorry I have a full house already. I'd take all four. Lamm was a brilliant choice as surname for these kittens. Love that Baxter looks like an interloper from another litter -- a splash of orange tiger amidst the cream poofs -- makes me chuckle. Having trouble telling Edna and Edison apart. I agree with the above poster who notes that Edna's markings are a shade darker but are there other identifying clues? Is that Edison or Edna featured in the next to last photo? In the 7th photo is it (from left to right): Eddie, Edna & Zelda? 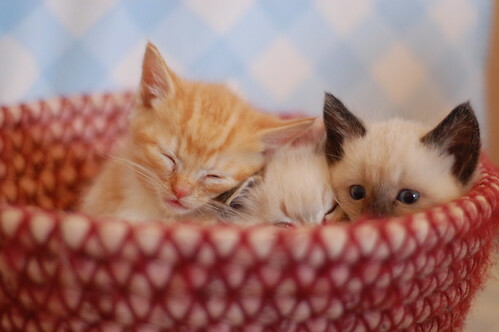 Is there anything so snuggly as kittens in a basket? 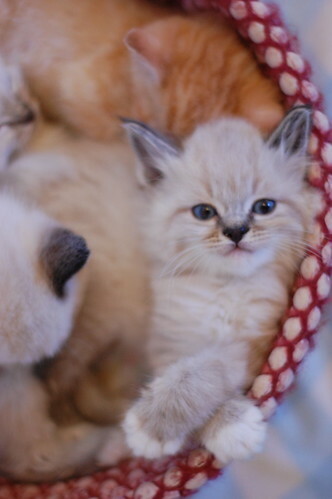 I'm a mama to a ragdoll boy and his pale marmie adopted brother. 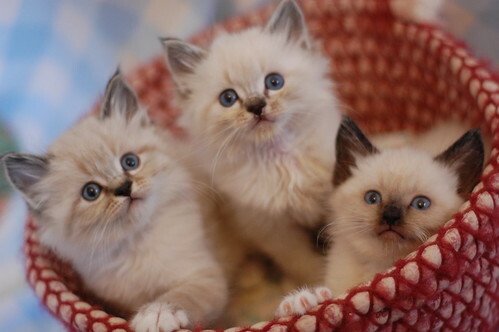 Any one of these sweeties would blend right into our family. Too bad we are on the wrong coast! 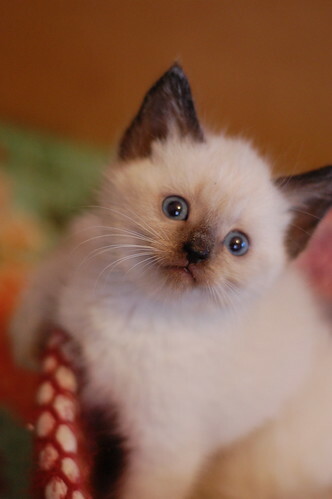 What a wonder of cute kitteness! What a precious little bunch. Oh my goodness, the crossed paws. My Moo likes to lay like that a lot when sleeping or lounging in the sunshine. It kills me every time. 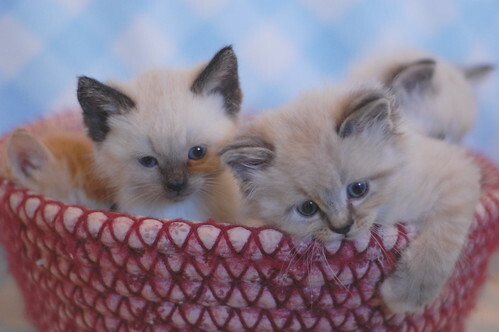 I swear, every new little kitten family you get looks even cuter in the pink basket. 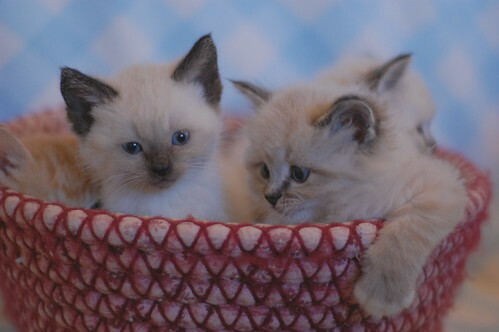 Did you have *any* idea when you originally got that basket that it would turn into such an iconic kitty photo spot? The little Lamms are such precious little lambs! I need this basket on my desk. NEED IT. I have to say that I think that this is one of the cutest litters ever!!! So tell me, how on earth do you get ANYTHING done? Ever? With every litter, you manage to post so many adorable photos of every possible angle and pose. How do you find time to eat or sleep?? ?